Two Bears Farm and the Three Cubs: Busy? Who Me? You were a lot more busy than me. 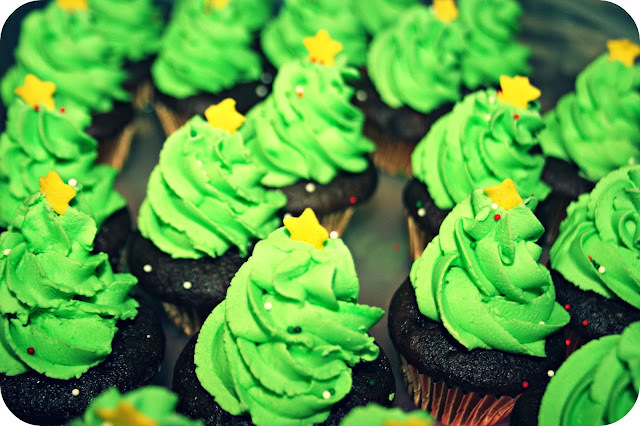 I like those little christmas tree cupcakes, very creative. Put those feet up after a run of course. I still feel I am in the season, wait, New years is around the corner.A day that all I want to do is eat. I actually escaped the usual go-go-go this year, much to my amazement. Except for one late gift (thanks to UPS) I stayed pretty calm and busy-free. But then, I am old as dirt and it's about time for things to slow down, while you have youth on your side! LOL! Happy New Year! Pierce is rocking that tie and 'do! Wow! You were busy! 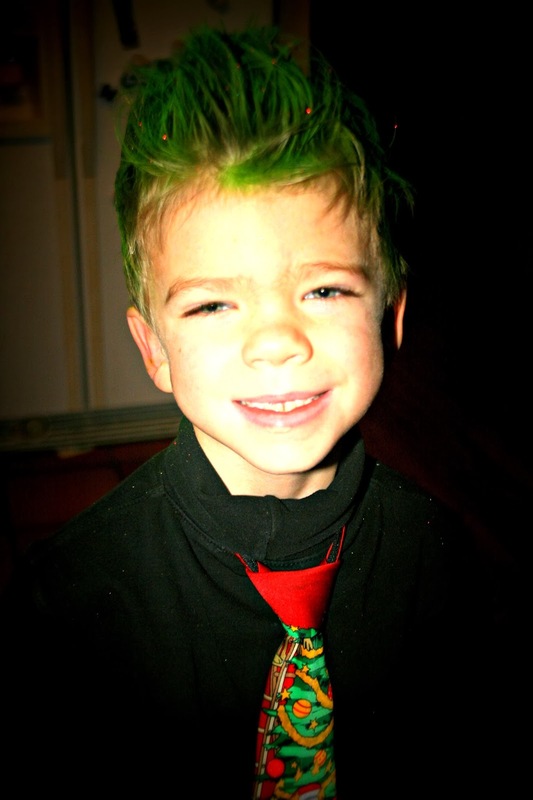 I love the Grinch colored hair! Yes, the actual holiday was rather stressful for me -- my mom's small house packed with 20 relatives will do that to a person... but the time leading up to Christmas wasn't nearly as busy as yours! Enjoy your time off my friend and Happy New Year to you and yours. And I thought I was busy. You had me beat by a long shot. The cupcakes turned out great by the way. The cupcakes look great. Very festive looking. Thankfully, we were able to take it easy this year! It was really nice! We had a few obligations, but paced ourselves quite well. Now it's all relaxing until school gets in session again. I think it's awesome that there was a Happy Birthday, Jesus party. :-) I hope you get a chance to wind down and enjoy your boys now that the rush is over. Your schedule makes ME out of breath. :-) I was very busy Christmas Eve and Christmas Day. I was supposed to be off Thursday, but news happens when it happens, and I had to work a little. Today is busy, and I gave to work some tomorrow. So I am looking forward to New Year's! I hope you get some much needed rest. What a terrific Mom YOU ARE!!! GREAT Grandmother??? The BEST. My Great Grandmother was/still is a best Friend to me. happy you made it to the other side! I was super busy! My husband all the sudden had to work Christmas Eve day. His boss said that he wasn't going to have to, then they got swamped. that is too funny - i thought you little one was going for a Grinch look? what a great hair day in my book. I remember how busy Christmas was when my daughter was a child! Busy, but satisfying. Your posts about your kids always make me smile and remember happy memories! Christmas here was quiet and simple! No complaints from me about that! Congrats on the Etsy orders!! That's awesome. Glad you had a busy, but fun time with the kids. Still love that you rescued that horse. xoxo! oh those cupcakes are soooo cute!! and amazement square can wear you out for sure! now go relax!! I managed to stay relatively sane. Family over Christmas Eve and Christmas Day. Shovelled the snow, and a few thing like that. Now visiting friends all around the world. A very good Christmas! Luckily you are in shape. Not everyone could have lived through this! Those cupcakes came out great. I love that the pre-school has a Happy Birthday Jesus Party. My oldest wanted to put a candle on dessert on Christmas Eve to sign Happy Birthday to Jesus. The holidays always test my limits! My kids always have, "extra", things going on at that time. Always have! Plus, we have many family obligations. Glad you survived! I have one more week off before going back on Jan. 2nd! Yummy cupcakes! Green hair... so match! You have been busy! Glad you'll get a little break now. You deserve it. Delicious picture! and interesting story..
Love the 'crazy hair day'....AND his adorable smile! It always tests my limit but things always do get done. Love the cupcakes and the green hair! I WANT one of these awesome cupcakes!! Pierce looks so cool, and his hair matches his tie! As to Christmas, Anne Marie is sick and on steroids and I have been to doctors all day after Christmas. BUT finally getting my eye surgery so I will be able to see to post, I can't wait! I will kick the new Year off with new eyes!!!! Well done! I had a fabulous 2 days with kids! You sure had a busy week. We are on our second stop. We have one more week of driving then we will head for home. I love breaks when the kids are home and you don't have to be somewhere or do something all the time. There were moms who dreaded breaks and summers--but I loved them. All that down time!! A mothers work is never done. But you sure do a good job of it.